Posted on November 9, 2008, 3:42 pm, by ohiit, under Incomprehensible thoughts. See on the diagrams of mind-setting I have drawn out as a guidelines. Why discipline is so important in our everyday life? Because discipline is not everyone’s favourite word. But self-discipline makes all the difference. Discipline is something you can’t be learnt by heart but experience, it is something within you where you have to tap your potential to see what are the strengths within you to achieve your true forms. It all lies in a mental state of control that need to know where you have made mistakes in life and convert this into strengths with the best abilities to your health that need alot of mind discipline from the ground up that is what the basic foundation is all about. Discipline can be very board and wide. It is so vast that there are alot of theories lying around. 1a) With good health you can create intelligent lifeforms where it can bring your thoughts to have a proper mindset with different issue approach at an analysis to a higher level. Heath is a wealth of intelligent with critical thinking that enables you to think with great ideas that comes creativity rather than boring thoughts all the time that is not fresh everyday or your mind will be stagnant forever. 1b) With good health you can create a great mindset with open mind where you have not dared to dream of achieving your goals in a realistic way where things can be approachable in all different ways which you need a leap of faith within you to have the answer knocking on your doors that opened the road to wealth. 1c) With good health you can create a good cashflow of your money where you need to maintain good mental and physical level state so you can work smart with money of a good mentally that can achieve in an unlockable financial intelligent where it can open your views in a bigger picture. Not lead by cheap tactics and scams that befalls you just because you want to be greedy that will lead you to a downfall. 1d) With good heath you can have the right attitude that is needed to build your reputation of your wealth’s intelligent for the greater good cause. It is not something in everyday life where attutude can have a grasp within you. It is all about the discipline that lead you to change the attitude to match your mental state of values and belief to control in the right way. Above all the discipline always have a lifecycle. 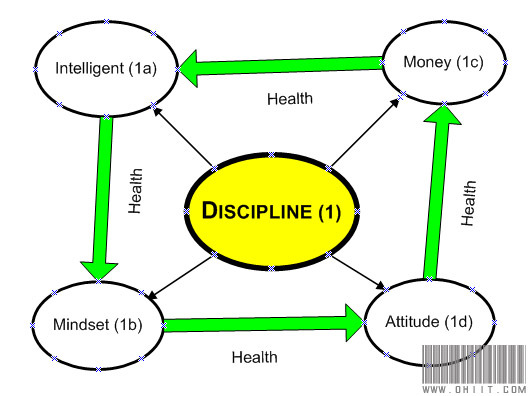 As you can see the arrows pointing to each other “Intelligent > Mindset > Attitude > Money” and back. It is the basic foundation of mankind’s lifeforms that is needed in everyday life. With boarder intelligent discipline you can have greater self-motiviation, able mindset, finer attitude and money cashflow mentally well.